The battleships the US operated during WW2 fall very nicely into two categories: the slow battleships built before the naval treaties, some dating back as far as 1910, and the fast battleships, built under the naval treaties from 1937 onward. When Pearl Harbor was attacked, the first of the fast battleships had only recently commissioned, and were still suffering from teething troubles. The ships at Pearl Harbor were the later slow battleships, units of what was known as the ‘standard type’, built during a period of relative stability in US battleship design. Where the fast battleships really shone was in providing anti-air firepower to carrier groups. The 5” guns were excellent heavy AA weapons, and battleships had the size and stability to accept large numbers of light AA guns. 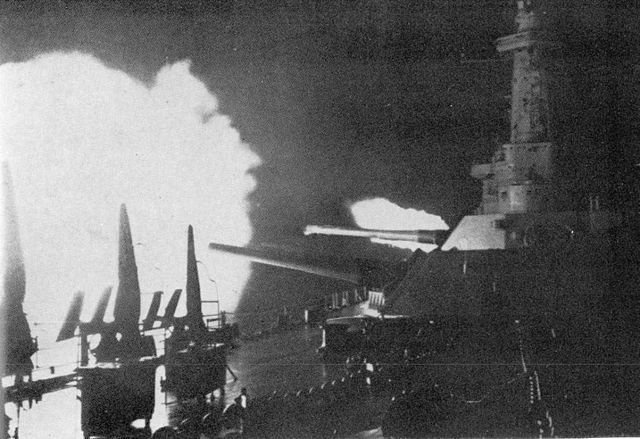 The design armaments of 4 quad 1.1” guns grew to as many as 20 quad 40mm Bofors mounts and 50 20mm Oerlikons. 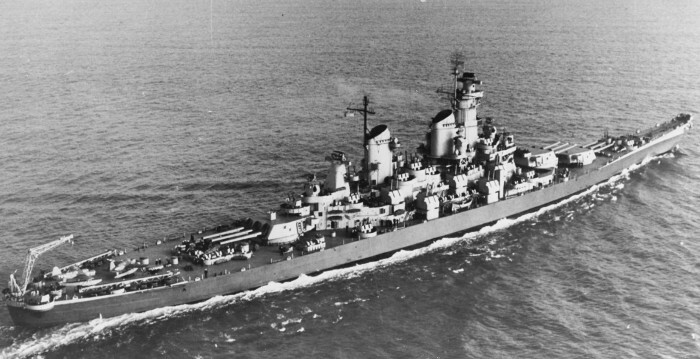 The extra men required, up to 55% extra over the original compliment in the case of Missouri, made the ships very crowded, and the mounts themselves required that main gun arcs be limited to avoid blast damage. The Iowas were particularly effective, as they were the only ships capable of keeping up with the carriers at full speed, and their size gave slightly better positions for the guns than was possible on the smaller battleships. The slow battleships were mostly employed on shore bombardment duties, supporting invasions in both the Atlantic and Pacific theaters. The first of these was the invasion of North Africa, Operation Torch, where it was discovered that armor-piercing shells, the only type then available, were not particularly effective for bombardment work. High-capacity (HC) shells were quickly put into production. Initially, there were only a few ships available for these tasks, but the salvage of most of the ships sunk at Pearl Harbor and the release of others from defensive duties meant that later invasions often went in with several battleships in support. These ships also had secondary roles of providing AA firepower and protecting the landings from surface attack. 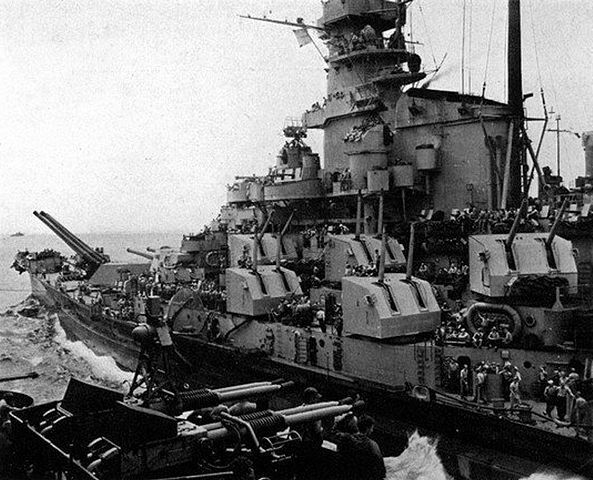 The fast battleships did their share of shore bombardment work, although not usually in support of invasions. Bypassed Japanese-held islands were favorite targets, for keeping crews in practice and reducing any remaining military effectiveness. In July and August of 1945, during operations by the Third Fleet off of Japan, the fast battleships also conducted several bombardments of the Japanese home islands, destroying factories and being rated as more terrifying than raids by B-29s by the population. The classic role of the battleship is sea superiority, destroying other surface ships. The rise of air power meant that this was rare, although not entirely absent. Several fast battleships served in the Atlantic, keeping watch on the German fleet, while some of the slow battleships spent much of the war guarding important convoys against surface attack. The ‘standards’ left after Pearl Harbor spent the first year or so of the war protecting Hawaii and the west coast of the US, before joining the bombardment line. 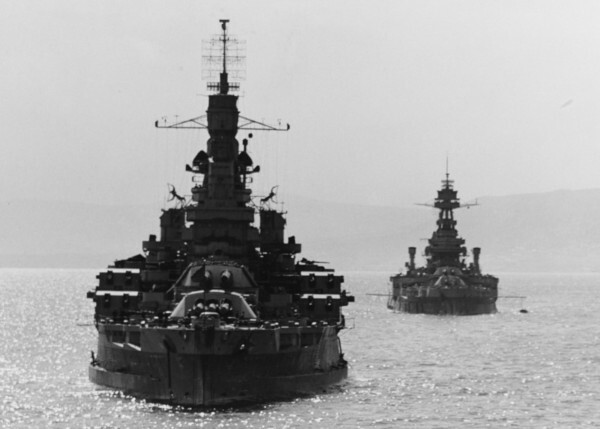 But on three occasions, US battleships met their counterparts in combat. The first two both happened during November of 1942, on opposite sides of the world. During the US invasion of Morocco, the incomplete French battleship Jean Bart was anchored in Casablanca harbor, and the USS Massachusetts put her out of action following a gunnery duel. Massachusetts and her escorting cruisers also fought the French destroyers which sortied to attack the landing beaches later during the action. The second was six days later, part of the string of naval battles that occurred off of Guadalcanal. After a rather messy battle between a US cruiser-destroyer force and the Japanese two days earlier, Admiral Halsey detached the battleships Washington and South Dakota from his carrier screen and sent them in to prevent the Japanese, led by the old battleship Kirishima, from bombarding US positions on the island under cover of darkness. 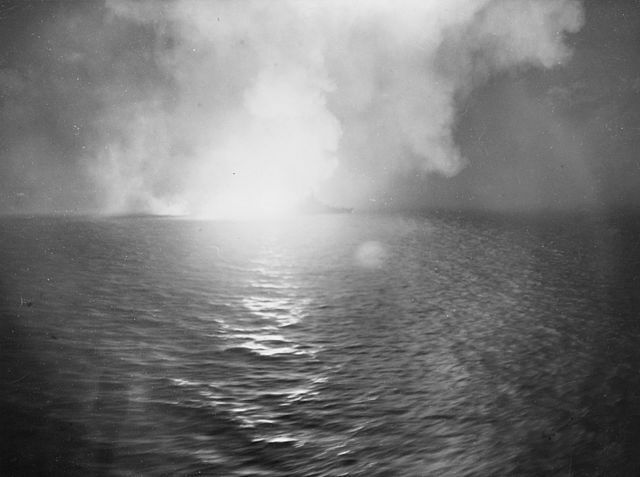 An initial clash between the American destroyers and the Japanese did not go well, leaving two ships on fire and sinking. South Dakota’s participation was scarcely more dignified, first setting one of her own airplanes on fire with her guns, then losing most of her guns and her radar to a circuit breaker problem. The Japanese found her after she steered in front of one of the burning destroyers, hitting her 27 times (although only once by Kirishima’s 14” guns), and compounding the electrical problems due to numerous shorts. Washington, however, had remained undetected, and opened fire on Kirishima at 8,400 yards, landing 9 hits from 75 16” shells fired, without taking a hit. Kirishima sunk about 3 hours later. Two years later, it was the turn of the slow battleships. During the US invasion of the Philippine island of Leyte, the Japanese attempted a complex counterattack, drawing off the US carrier fleet and then sending in battleship forces to pincer the invasion fleet from the north and south. A series of mishaps allowed the northern Japanese force to get through mostly unopposed, until it was stopped in what I believe to be the finest moment in the history of the US Navy, a tale I intend to tell in full in the near future. 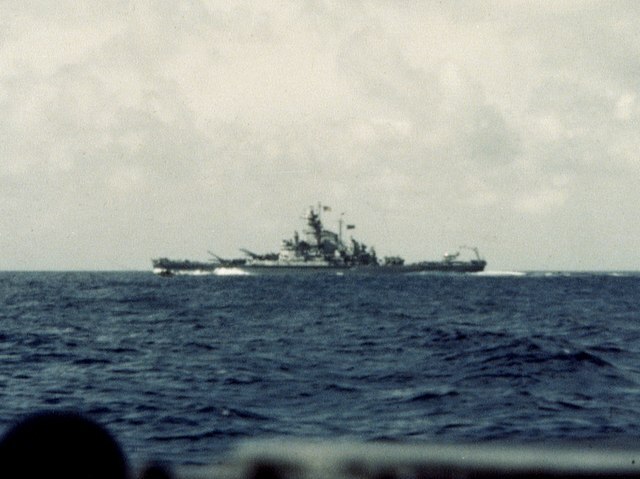 The southern force, including the battleships Fuso and Yamishiro, passed through Suriago Strait, where, in the words of John Schilling “a Japanese task force encountered a fleet of invincible zombie battleships on a dark and stormy night”. All but one of the ships was a survivor of Pearl Harbor, and, thanks to superior radar and aided by torpedoes from their escorting destroyers, they sunk both Japanese battleships without a scratch. It was the last time battleships ever met in combat, and a fitting revenge for ships the Japanese had sunk at the very beginning of the war. Can you add back-to-the-footnote's-location links to the body of each footnote? I haven't done so because I have to format all of that manually. I'll think about it. Re: Footnotes: I will look into the possibility of providing a way to automate this. You mention that the bombardment by battleships was considered to be more terrifying than B29 raids. Do you have any indication as to why? Incendiary bombs vs high-explosive ammunition? Differences in length of the raids? Accuracy? @Eltargrim Not really sure. The one incident that was called out in my research was definitely not particularly accurate. They did only minimal damage to their target because they were shooting completely blind, but a lot of the shells landed in the surrounding city (but maybe that was the point). More details in Iowa Part 4. The parenthetical in the third paragraph is not entirely correct. Though the fast battleships did indeed spend much of the war screening the carriers from air attack, it is not true that this was "the reason they were fast in the first place". In evaluating the various design schemes for what became the North Carolina, the General Board recognized that the design ultimately selected was not "fast enough to work with the carriers". The following class, the South Dakotas, were also designed to maintain the 27 knot speed to maintain tactical homogeneity. Only the Iowa class truly had the speed to work with the carriers, but the extra speed was driven by the perceived need to counter the Japanese battlecruisers then thought to be under construction. None of the speed built into the modern battleships was driven by carrier operations (which in the mid 1930s was focused more on hit and run operations). As to the question concerning fear of the battleships, both the Vietnamese and the Lebanese were driven to the bargaining table when the New Jersey found itself off their shores. The contemporaneous thoughts of the enemy were that it was a weapon system for which there was no counter. 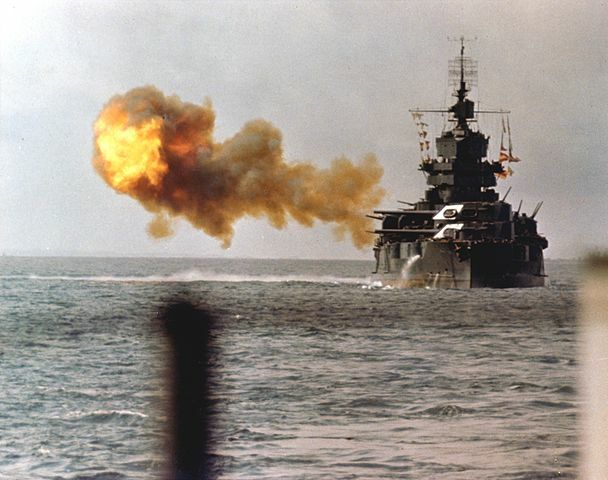 The Vietnamese could shoot down our planes, but it was impossible to stop the incoming rounds of the battleships and the battleships themselves were immune to their weapons. When the initial design work was being done, the North Carolinas were considered fast, and if not for the discovery that the Japanese battle line was substantially faster than expected, the SoDaks may have gone back to 23 kts or so. Ref is the first few paragraphs of the North Carolina chapter of Friedman's US Battleships. They couldn't go for more than 27 kts because it would have been prohibitively expensive in terms of other capabilities on 35,000 tons. The Iowas were fast explicitly to cover the carrier force against the Kongo-class battlecruisers/battleships. I think what the General Board did when they got the extra 10,000 from the escalator clause is pretty conclusive in terms of what they wanted. @Eltargrim: I've seen at least one source which reported demoralization among Japanese civilians - even if they weren't under bombardment themselves - due simply to the fact that enemy warships were operating within visual range of the Japanese coast... And the Japanese military not only couldn't stop or prevent it happening, but didn't seem to have any response at all.